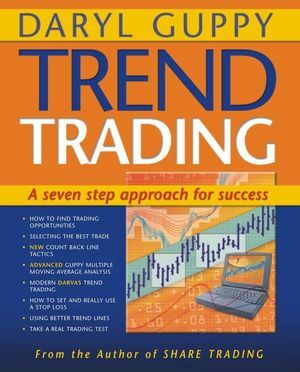 If you have no time to follow the market closely, then Trend Trading is the book for you. Trend trading is one of the most effective and easy-to-use methods for making money in the market. Success depends on identifying the trend with confidence and catching the trend after it has started, and on getting out as soon as possible after the uptrend turns into a downtrend. The book examines in detail the steps in finding, assessing, selecting, managing and monitoring a long-term trend trade. These are proven, successful methods which are easy to understand and apply. Included are the most recent updates and developments in using the count back line and the Guppy Multiple Moving Average. Daryl Guppy also includes a practical look at setting stop loss conditions to protect capital and profits, and a bonus section on Darvas-style trend trading which is the first significant update of this technique in forty years. Trend Trading shows readers how to use and apply the analysis tools to find effective long-term trades. These can be applied to any group of selected stocks, whether chosen on fundamental criteria, from stock tip newsletters, or found using database technical scans. From this starting point, Guppy shows how the better trades are identified, how risk is managed, and how the trades are closed successfully. The book includes examples of Daryl's personal trades. Daryl Guppy is the founder and director of Guppytraders.com. He is an active private trader in equity and derivative markets. He is the author of several financial market books including, Trend Trading, Share Trading and Trend Trading Master (available in Chinese).Guppy writes in several Chinese language publications, including a fortnightly market commentary column in Beijing's Weekly On Stocks magazine and Shanghai Securities News. His book Trend Trading Master is available in Chinese. He conducts regular financial training seminars in Beijing, Shanghai, Nanjing and other cities in China. He has guest lectured at Xi'an University. Guppy is a regular contributor to trading and investment publications in Singapore and Malaysia, including The Edge, Personal Money, and Smart Investor. He provides certified professional financial market training for the Singapore Society of Remisiers, and the Hong Kong Securities Institute. A member of Technical Analysis Society of Singapore, the Australian Technical Analysis Association, the International Federation of Technical Analysts and Australian Government Securities and Investors Council, he also belongs to the Australian International Business Council and the Australia China Business Council. Guppytraders.com has offices in Australia, Beijing and Singapore.